Earlier this year I think I used the term "paralysed by indecision" as I considered all the options for moving to the UK. 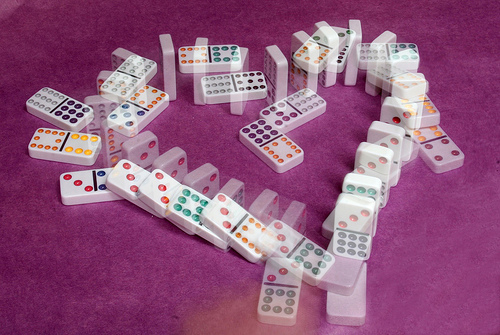 At the time I think I was like a deer in the headlights as I worried about the myriad of decisions that needed to be made, but as a result of a coaching conversation I came to realise that what I needed to do was simply to make the first decision and that others would fall into place naturally after that - a bit like a series of dominoes that needed the first one to fall and give the rest of them a push. And truly, having started the push, I do feel a lot better - more in control. In The Subtle Art Mark Manson writes "Action isn't just the effect of motivation; it's also the cause of it." It's true that most of us only act if we feel motivated to do so, however the reverse is also true: action can lead us to become inspired, which in itself can lead to us being motivated, which can then lead to more action. Sometimes you just have to do something, even if you initially lack the motivation to make such an important change, and then harness the reaction to that action as a way of motivating yourself.